I tried to do some self portraits with my big dog camera, but I failed so you get phone camera pictures again and probably till the end of the pregnancy. ha. I don't have a tripod (lost it at a wedding a while back) so I just couldn't get the camera at a good angle. It was frustrating. 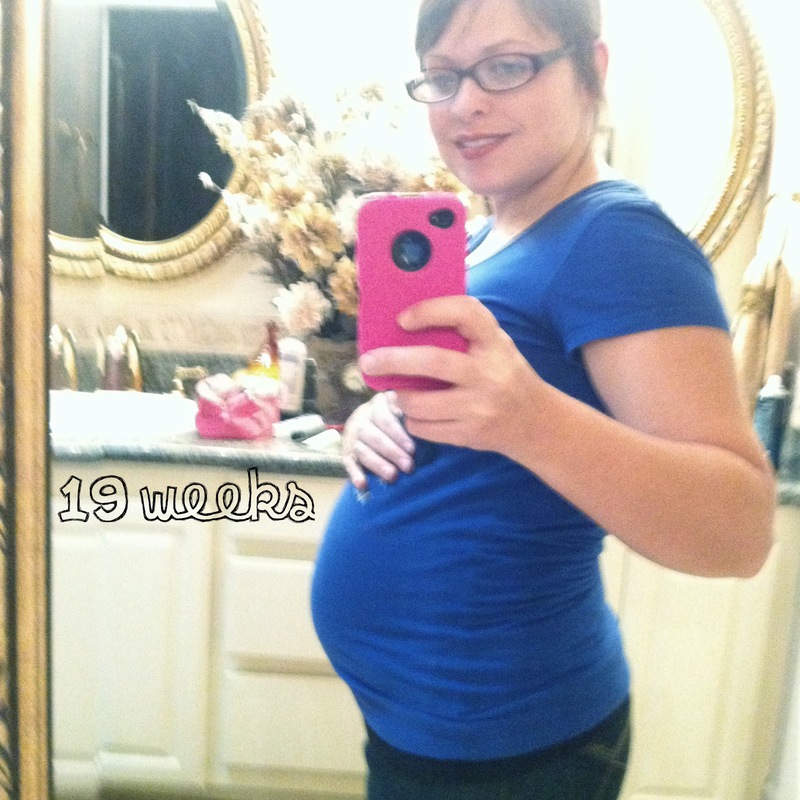 Here I am at 22 weeks. Not much change from last week. I am feeling tons of movements and they are getting stronger each week. I have had tons of energy! This I am excited about. I have a clean organized house and it has been that way for almost a week now. Those with kids understand that keeping a clean house can be quite a feat. I have a system going now to keep up with my laundry and dishes and I just repeat this system like clock work and this all results in a happy Amy. Cravings are getting less specific. I really want juice, specifically orange juice... anything sweet, like fruit and pastries. I don't give into my cravings all the time. Last night I had a moment of weakness. My stomach was hurting so bad from what seemed like hunger pains. We don't have much in the house right now because our week is up and we are supposed to go grocery shopping tonight... so I LITERALLY scrounged. I ended up eating a slice of medium cheddar cheese, about 6 bread and butter pickle slices, I lucked out and found a Hershey's bar on top of the fridge but it was warm so I got a spoon and ate a couple bites with crunchy peanut butter... then I drank some water and went to bed. How's that for a midnight snack? ha ha ha. Yesterday's walk was tough, though. Not because of my SPD but because I am SEVERELY bugaphobic. I mean. I DESPISE beetles, cicadas, butterflies, dragonflies, grasshoppers, bees, and the like... I can force myself to function in spite, but when there are dragonflies out in plague proportions, that's when I can't bust through that mental wall. I literally get goosebumps, and start hyperventilating. I walked about a mile before it got to me too bad. At least I walked though. I think that's about all for this week's update. I don't think I left anything out. My next appointment is mid August. CAN YOU BELIEVE JULY IS ALMOST OVER??? 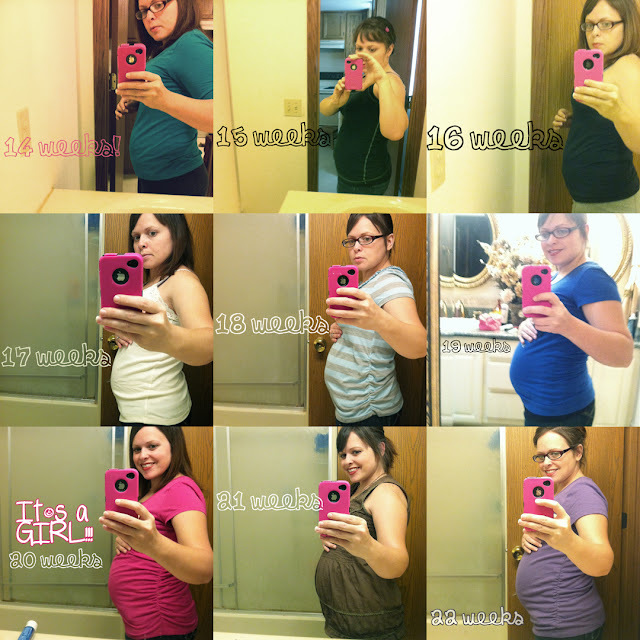 Also wanted to add this... My pregnant belly progression... so far. HEART BUUUUUURN!!! Oh my gosh. Main complaint right now. ha. I had it bad with both of my previous pregnancies, so really, I am not surprised to have it strong again. Oranges. Yum. It's what I have been wanting lately. Oranges, orange juice, anything made with orange... give it to me. ha. I have also wanted chocolate. Dave was awesome yesterday and he brought me home a can of orange juice to mix up and 2 bars of my favorite chocolate, which happens to be Cadbury Fruit and Nut Chocolate Bar. DEEEELISH... so cravings are satisfied. This is where it slows down a bit because I really have nothing to look forward to for another 10 weeks or so... 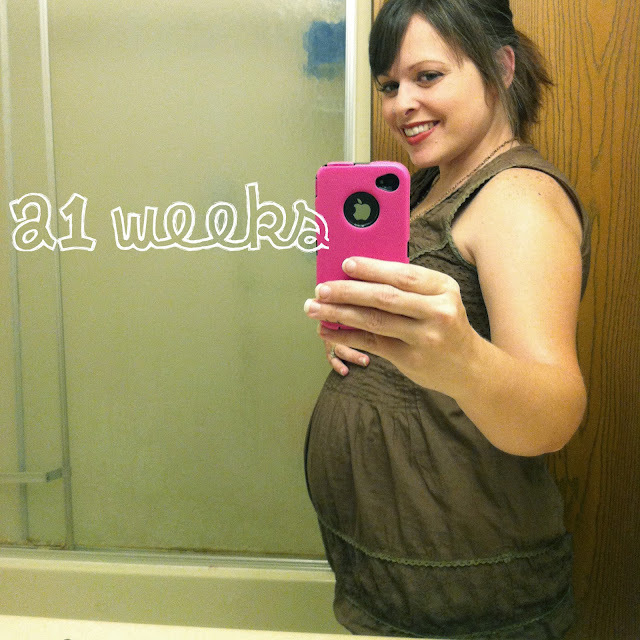 This little stretch of pregnancy will be very slow... but not as slow as the last 3 weeks, which are sheer torture. I am carrying this little baby SO LOW! Both of my other ones were higher. Lindsey being the one I carried the highest. I carried her so high that after I gave birth to her, my ribs SERIOUSLY felt broken for like 3 months after. Bren wasn't nearly as high, but he was high... my ribs didn't get as stretched with him. This one... is doing a number on my pelvic bone, so I am experiencing a whole new world of pregnancy discomfort with this one. No big. I can handle it. Thought I would add that baby Avery has been kicking and moving around and it has been so fun to feel her movements. Not only does it give me peace of mind, but it is also one of the coolest things about pregnancy. I thought I would share a story of Bren and naming the baby. Before I had the ultrasound I asked him again what he hoped mommy was having. He told me a boy. I asked him why since he had previously said girl. He said "So I can name him Lightening McQueen." ha ha ha. I laughed and said, I'm not going to name a boy Lightening McQueen. He said "How about Dynaco?" ha ha ha... I laughed again and said I am not going to name a boy Dynaco either. SO FUNNY. So right before the ultrasound I asked him again and he said girl this time, I asked him why the change of heart, he said "because you won't let me name him Dynaco." I thought it was so funny. My Cars Obsessed little boy. He is my daily entertainment. That is all from me on this week's pregnancy updates. Hope you all are enjoying your summer. With August approaching, fall will be here before we know it, and I couldn't be happier. I can't express to you how much I love the fall. Ok. Now that it's been a few days and I know a lot of you have seen the movie by now... this is my last major post on the last movie installment of Harry Potter. PLEASE: IF YOU HAVE NOT SEEN THE MOVIE YET OR READ THE BOOK PLEASE SKIP THIS POST AND COME BACK WHEN YOU HAVE!!! PLEASE PLEASE PLEASE. I do not want to be responsible for spoiling anything for you. ...so to have him pull his broken wand out of a pocket or bag and repair it with the Elder wand would have been easy peasey... then if the movie wanted him to snap the wand in half so bad, do it then... but for goodness sake... Repair his fracken wand. That wouldn't have been too difficult of a scene, now would it have? Am I the only one that this bugged??? So that's my gripe with the last installment. I loved it... cried like a baby... there was some BRILLIANT acting done by my favorite Alan Rickman, Ralph Fiennes, Helena Bonham Carter, Michael Gambon (who I initially HATED as Dumbledore but came to adore him after HBP), etc... It was all great. Except for... the wand. Grrrrrr. Don't you crazy heads worry, I'm not a spoiler. I will tell you, in a careful way my feelings though. Yesterday, from 9:30am on Thursday until 2:30am on Friday, was waiting in line and talking and laughing and waiting and laughing and finally getting to see the FINAL installment of Harry Potter. my feet did end up swelling a little bit but not too bad. I'm not going to lie... being 20 weeks preggo and sitting on concrete or lobby floors wasn't the most comfortable of situations, but Harry Potter is worth it. crowd photo taken by my hubs. Ignore my looks. Being in the heat from 9:30am until 5:30pm does NOTHING for my looks obviously, but I had to get some pics with Tiff and Dave. I have ONE pic of Leez and my bro, and since I don't think Liz or Anthony would really like the picture being posted I will refrain, but they were there and I was very glad. Tiffany took the above two pics btw, with her handy dandy iPhone. :) THANKS TIFFANY! I may have her guest blog someday. She's awesome. Like I said. I am not a spoiler... and I will not give away any specific details of the movie... but just in case I do spoil something for you... you can skip over this paragraph. To sum up my feelings about it: the parts I loved... I LOVED. The parts I hated were really sucky. So there. I will tell you that Snape is my most favorite character of the books and for you amazing book readers out there... while movies shorten and take away... I adored seeing Chapter 32 & 33 come to life even in a condensed way. I BAWLED like a baby. LIKE A FREAKING BABY! ha. Alan Rickman is amazing and he REALLY nails his role in this last installment. That being said, I did NOT love this movie (EDIT: wanted to clarify that I didn't hate it either... email me if you want to know more). It was fantastic and it was great and I don't expect movies to "get it right"... but as a reader of the books there are some things that I found pivotal to the WHOLE STORY, that either got messed up or left out... so go see it and make your own decision. Harry Potter has been such a fantastic world for me to escape in. I am so heartbroken that there are no more movies or books to look forward to. When I bought the last book at Walmart, at 12am in the morning in 2007, I was excited and so very sad to know that my favorite story of all time was coming to a conclusion. I took comfort in the fact that there were still a few movies to come out... I think at the time Order of the Phoenix was about to be released. Now, with this last movie... it's the end of a wonderfully magical era. I'm so glad that I can revisit the books as often as I like and that if I need a quick fix, there the movies are... but this is a very bitter sweet time for Harry Potter fans. To all of you who may have not read the books, or who maybe won't read the books for religious reasons. I have to tell you, you are missing out. For the religious ones who are worried about the books being evil... these books are not evil. These books contain amazing stories of love, strength, the bond of friendship, the triumph of good over evil. These books are good to the core. They show the importance of love and loving, persevering, and overcoming. Good moral lessons, and a brilliant writer at her best. Parents, at least read the first 3 or 4 books and... don't be afraid to let your children read these books. To the people who have only watched the movies... READ THESE BOOKS. To all my fellow Harry Potter fans. HIGH FIVE! and YAY for being a fan of one of the most AWESOME AMAZING FANTASTIC MAGICAL stories to ever be written. Week 20 WOOOOOH We're Half Way Theeeeeere! Ok. If you didn't catch that my title is a song... it is. I thought about, for a half second, posting the video of "Living on a Prayer" but I thought the wiser of it. Google it if you must. ha. Ignore the toothpaste and dirty mirror! ha ha ha. Ooopse. Sorry. This is how my Dr. visit went... Got the ultrasound done. My tech was awesome. She allowed me to view in 4D and I was so excited. I didn't even ask, she just flipped it over and it was so awesome. She talked the whole time letting me know what she was checking for and what she was measuring. An old trick is to drink orange juice if you want baby to move and kick, so I did JUST to insure that baby would be moving to get that money shot. Well. The ultrasound tech told me I am banned from the juices because baby was moving so fast that the computer could barely keep up ha ha ha. So funny. Baby is definitely a girl :) Which I am happy about for 2 reasons... 1. Because I want Brendan to at least be the only boy if he is going to have to be a middle child and 2. Because I didn't want to have to deal with the whole circumcision thing. So. AVERY CLAIRE is the name. :) According to the Ultrasound, baby is measuring 4 days behind my due date, but since it isn't a week, we are sticking with the December 1 due date. I could have sworn that I was a little bit ahead of my due date, but nope. Ultrasound measurements put baby at 19.2 weeks. So. 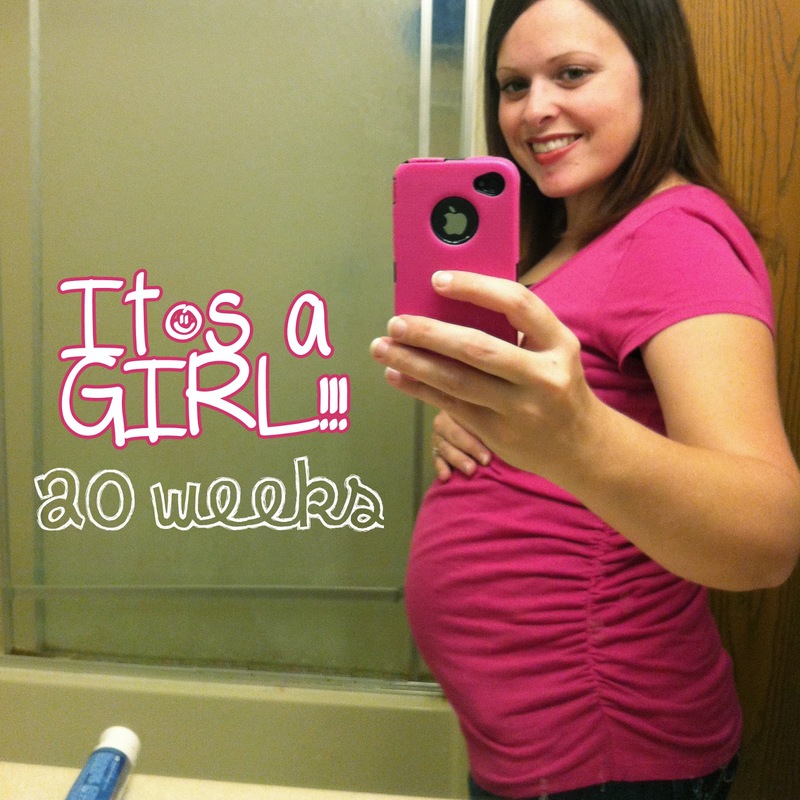 Because of this, I will be updating my pregnancy posts on Thursdays instead of Tuesdays now. That's that. Here are some of the pics from the ultrasound. Aaaaand I have a shot of the girl parts, but not sure if I should post my daughter's genitalia in sound wave form on the internets for the whole world to see, so just trust me. It's a girl. ha. All that being said, I have a FUN rest of the week coming up. Going to see Harry Potter and the Deathly Hallows pt 2 midnight showing. :) I am really excited about this... and sad... and emotional. ha. Hope you all have a Brilliantly Wicked rest of the week. I had such a wonderful time in Texas. I feel like that is a slight understatement. I love my Aunts and Uncles so much and spending time with them, my sis, my cousins, and my grandma was just the escape and relaxation that I needed. It began with an overnight stay in Harrison... I took my last "exercise" walk for what would be a weeks time. I snapped a few shots with my iPhone and thought I would share them here since I liked them so much. It's because of these types of pictures that I get upset when people make fun of Arkansas. It's such a beautiful state. I got my first yellow jacket sting... those things are viscious. In Missouri yellow jackets are smaller than bees and are little whimpy things, but nooooooo, everything has to be BIG in Texas! Their Yellow Jackets are the size of wasps and look like them too, only they have the yellow and black striped body. Dude that sting hurt. Leez helped me by getting my ice and baking soda. Let me tell you, baking soda is magic on a sting. Keep that in mind. After we spent a couple days at the Lakehouse, Amanda and I, along with the kids, spent 5 more days at our Uncle Jeff and Aunt Liz's house. 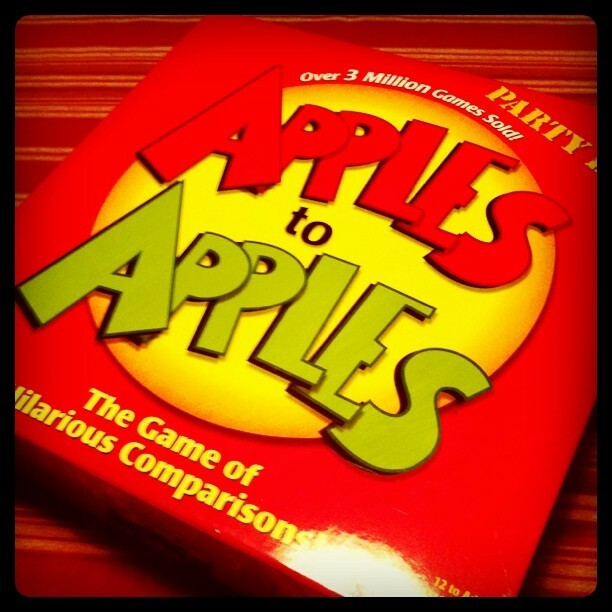 We had so much fun playing Apples to Apples and swimming... if you haven't played Apples to Apples, you must, it's a really fun game. I also got introduced to Julio's chips and salsa... SOOOOOOO good... you can only get it at H.E.B. I am so excited I got this picture. This is my cousin Courtney, isn't she beautiful? Next to her is my Grandma. She NEVER lets me snap her picture, but I got this one and was so happy. They both look beautiful. And that is all for my vacation pictures. I took so many more than this, but I didn't want to overwhelm you with tons of pictures... I had an unbelievably good time. I cannot WAIT to do this again next year. Last! 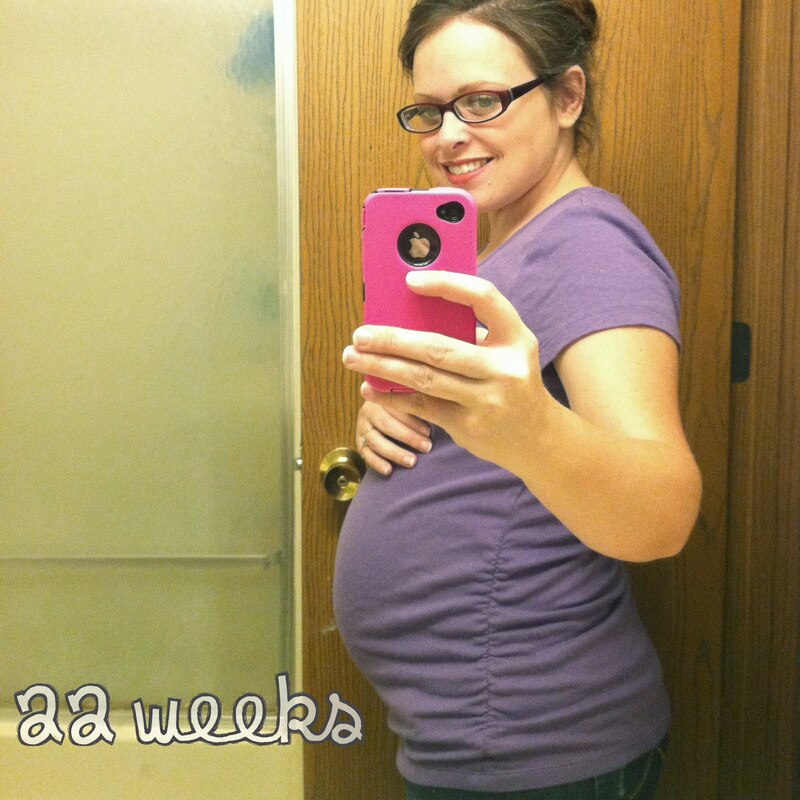 I wanted to give you my pregnancy/belly update from Week 19. I actually smiled, are you proud? ha. I am feeling baby movements. Nice and low on the belly. Started really feeling the baby move during my 19th week. I will have another belly pic for you on Wednesday, as well as the verdict of the ultrasound! Yippee! Can't believe it is already time for my ultrasound. Thanks for hanging out to the end of this post. Hope everyone has a brilliant week.